What were you doing when you were 17? I was in my last year of high school, mostly studying and working at the front counter of a local dry cleaner. Exciting times. Well, 17-year old Animesh Tripathi is working on making the Internet more welcoming to the 7% of the population that is colour-blind (including my brother). And his tiny $1,000 Indiegogo campaign which closes on March 22 has successfully been fully funded (but would happily welcome some additional funds!). Tripathi is planning to use his little research fund to conduct additional research: he was a finalist at the Google Science Fair and is now gearing up for the Intel International Science and Engineering Fair (ISEF) in LA later this Spring. 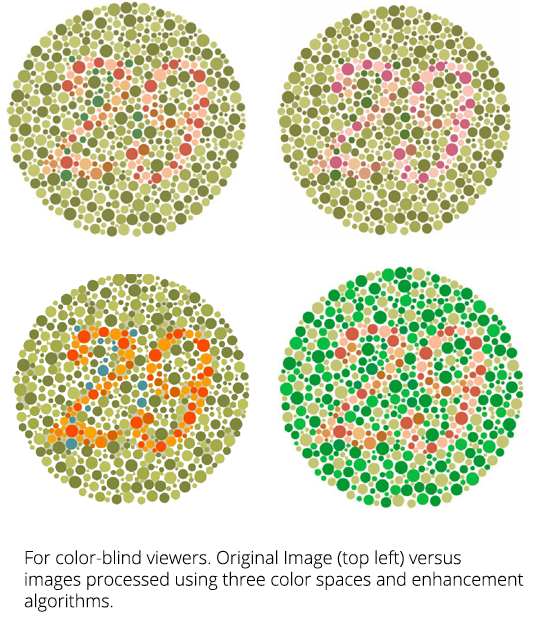 He has developed a Chrome plug-in that would enable colour-blind users to apply a re-colouring algorithm to their web experience, enabling them to see a higher contrast version of the web. If you're not colour-blind, you might not realize that there is a portion of the population that struggles at using websites and applications when designers use very similar colours in slightly different tones for functional aspects of their designs (e.g. to designate current page, differentiate buttons or status of an operation, and so forth). The Indiegogo campaign is intended to permit Tripathi to conduct his research and upgrade his tools. Like I said, it's more than fully funded but is still open for another couple of weeks.